Notice: Please note that we do not accept Wayspa cards. This top rated Milton spa believes that everyone deserves to be pampered and rejuvenated at special prices. That’s why at our Milton spa we bring you new weekly and monthly spa specials, discounts and offers. Be sure to visit this page often. New special offers are added frequently. Check out our current special offers and discounts below. 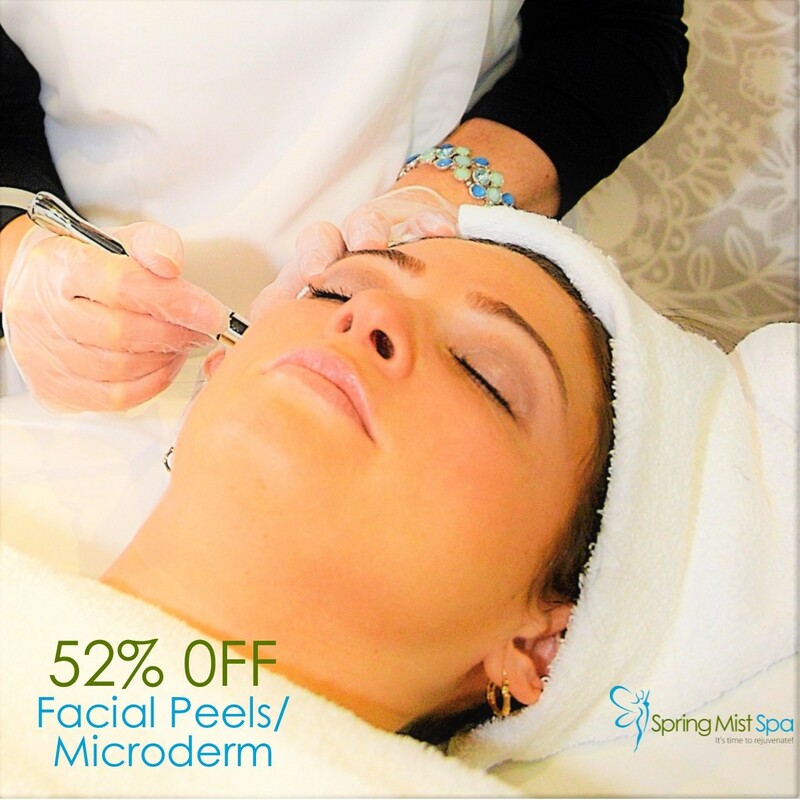 Treat your skin to a Microdermabrasion or a Peel treatment! For clear, smooth skin that’s free of blemishes and fine lines. To learn more about our Microdermabrasion treatment, click here! To learn more about our Peel treatment, click here! 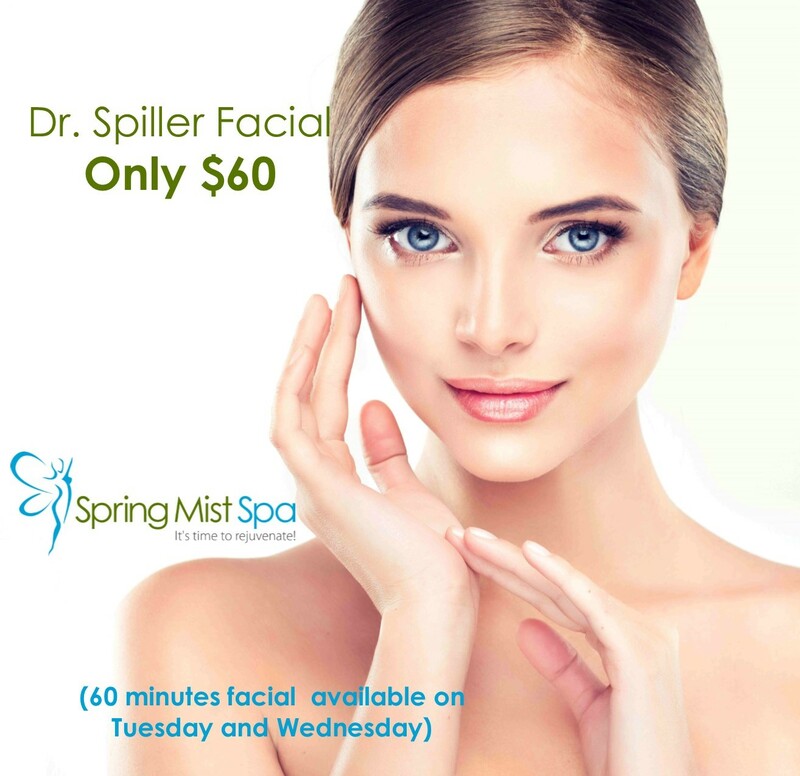 Get a complete 60 minute Dr. Spiller customized Facial for only $60 – on Tuesdays and Wednesdays in April. To learn more about Dr. Spiller Facials, click here! Acne Treatment using blue light s a highly effective method for treating acne. Get rid of acne while avoiding the side effects (such as dryness or peeling) that generally occur with Benzoyl Peroxide or topical prescription products. Free consultation. Call 289-350-0321 now to book or click button below to book online. To learn more about Acne Light Treatment, click here! 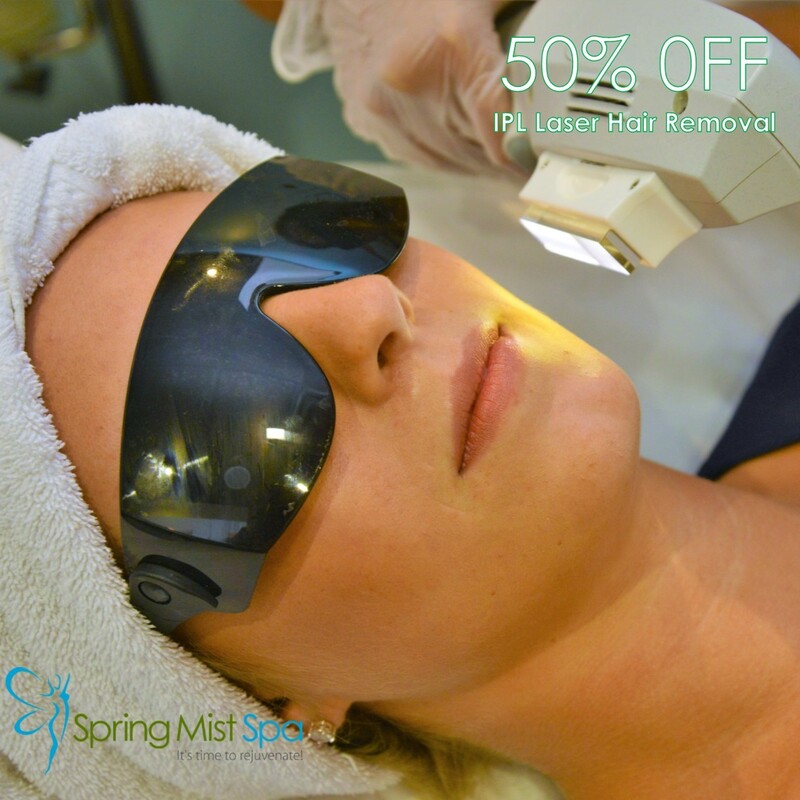 Book Your IPL Laser Hair Removal Free Consultation now by calling Spring Mist Milton Spa at 289-350-0321. Space is Limited. To learn more about Laser Hair Removal, click here! OxyGeneo and HydraFacial – Because Beautiful Glowing Skin is always in! World’s most advanced facials under one roof. Just one treatment and you will see the difference. No downtime, instant results. 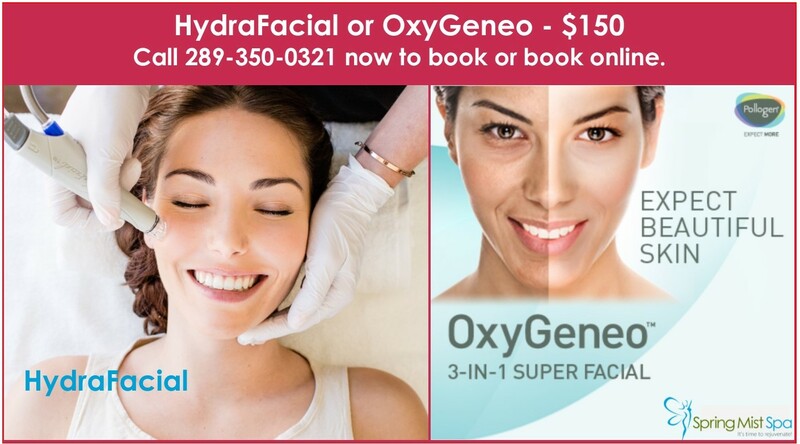 To learn more about OxyGeneo Super Facial, click here! To learn more about HydraFacial, click here! Get rid of wrinkles, fine lines, acne scars, stretch marks or uneven skin tones? 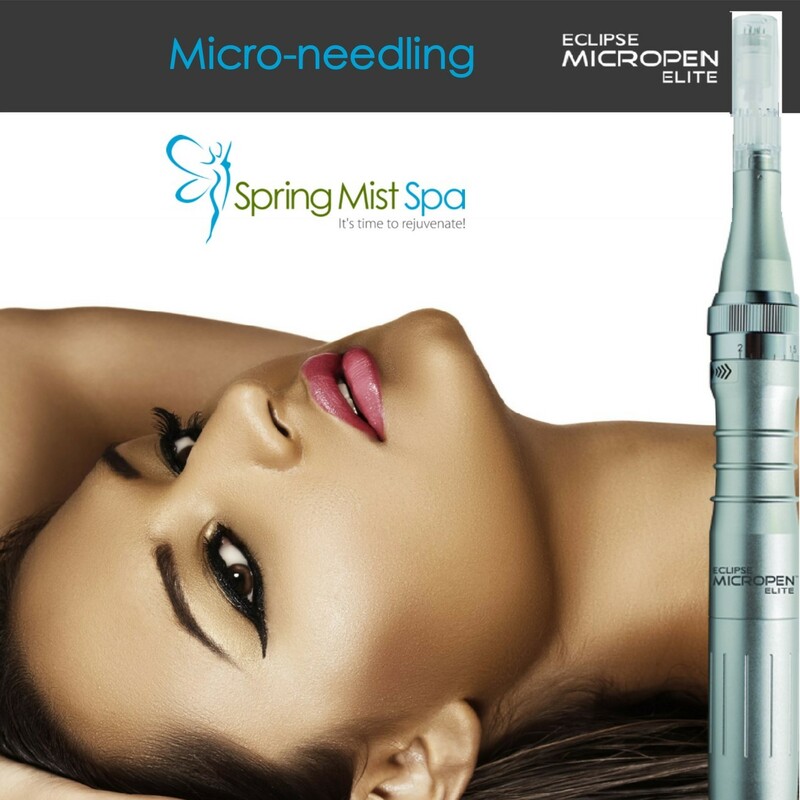 Try the revolutionary Epidermal Collagen Induction Therapy (Microneedling) at Spring Mist Spa. Only $200 when you buy a set of 3 treatments. Regular price $275. To learn more about Microneedling, click here! 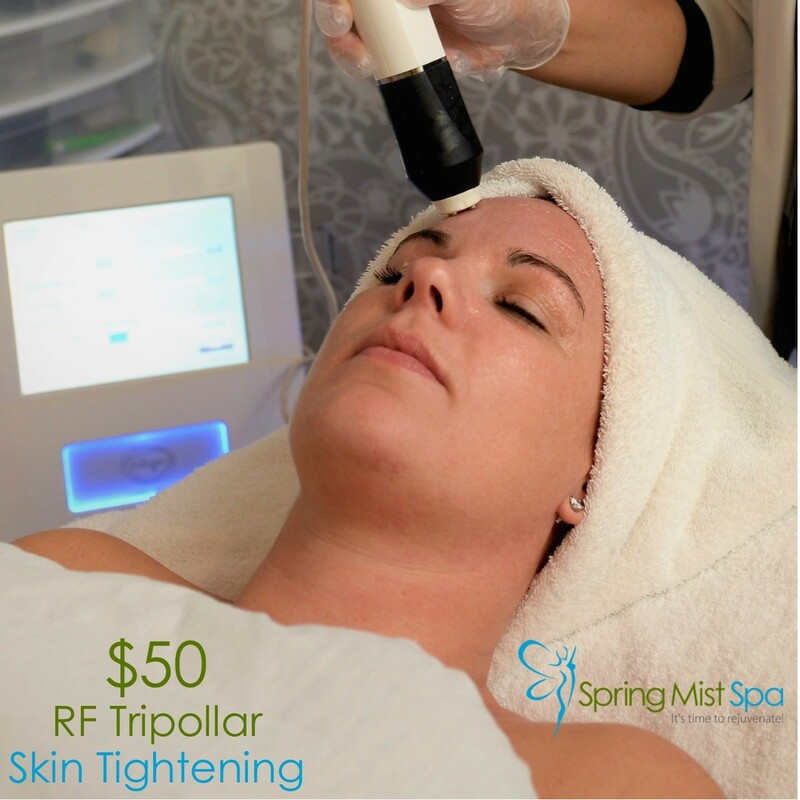 RF Tripllar Skin Tightening treatment tightens your skin and Reduces Wrinkles and Fine Lines. To learn more about Skin Tighteing Treatment, click here! *These spa specials are valid til April 30, 2019. Take advantage of Spring Mist Milton Spa Specials. Call 289 350 0321 today to book your appointment. Located at 65 Ontario St. S., Milton Mall, Next to Cora. Spring Mist Milton Spa is a modern, chic, beautifully designed day spa with a great ambiance. Our Milton Spa is conveniently located just outside Milton Mall. There is lots of parking at the door. Spring Mist Milton Spa’s knowledgeable, professional and friendly staff receive praise from our clients on a daily basis. We have been rated as one of the top day spa in Milton due to our excellent customer service, highest client satisfaction and affordable prices. Check out our monthly spa specials and come give us a try. You will be glad you did. 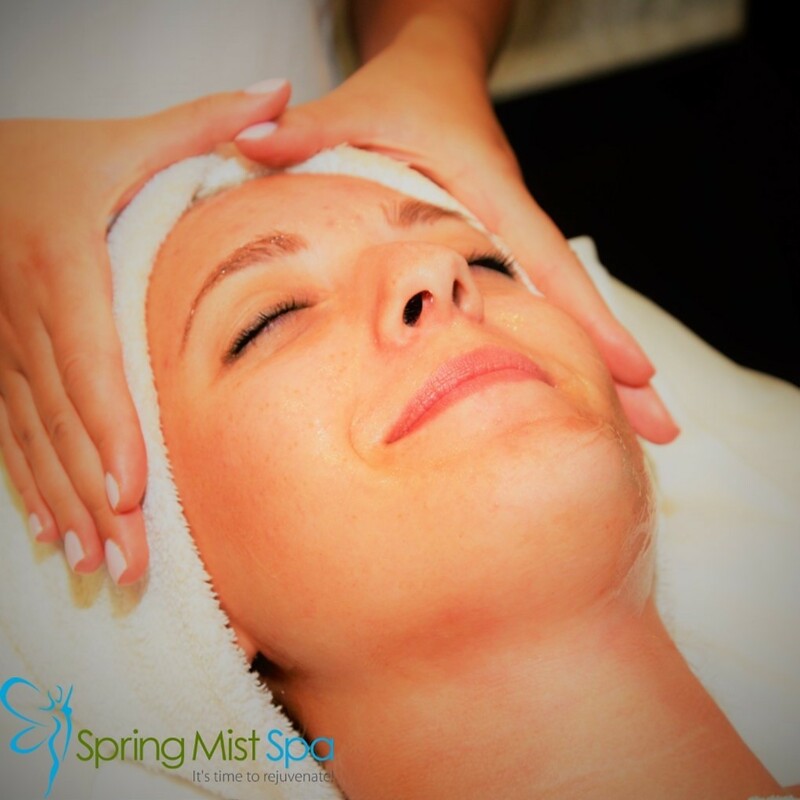 Spring Mist Milton Spa – It’s time to rejuvenate! Call Spring Mist Milton Spa at 289-350-0321 for your appointment. Or click below for online bookings.